Imagine a new hybrid coating that carries microscopic multifunctional nanorobots that can swim through body fluids and remove harmful bacteria and toxins? This may sound like something from a sci-fi movie, but it’s actually real technology being developed right now at the University of California San Diego. 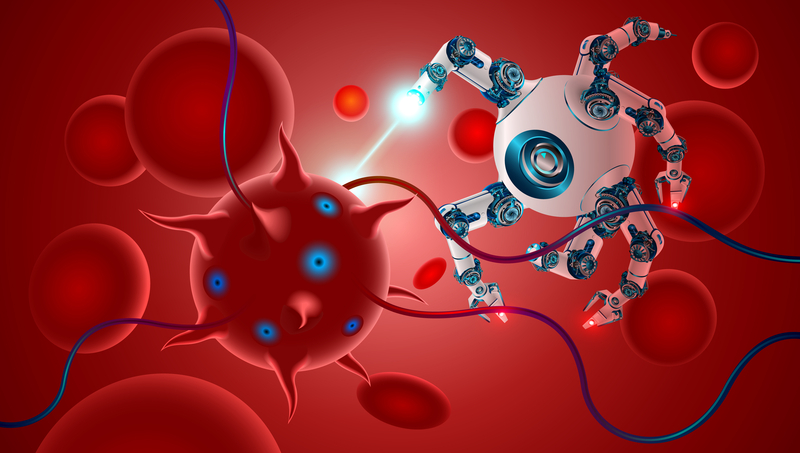 According to the university, this nanorobot technology research is still in its early stages, but has the potential for future use to decontaminate and detoxify blood and other body fluids. In their tests, researchers used the nanorobots to treat blood samples contaminated with Methicillin-resistant Staphylococcus aureus (MRSA), and their toxins, which cause staph infections. And after only five minutes, these blood samples had three times fewer bacteria and toxins than untreated samples. The nanorobots created at USC San Diego are so tiny that they’re about 25 times smaller than the width of a human hair. They are powered – made to swim through fluids – by ultrasound and they can travel up to 35 micrometers per second in blood. In creating the new hybrid coating, researchers applied high-frequency sound waves to fuse separated membranes from both platelets and red blood cells to each other. They then coated the hybrid membranes onto gold nanowires using specific surface chemistry. However, since gold is expensive, the researchers are also experimenting with making the nanorobots out of biodegradable material, rather than gold. National Coating Corporation is an industry leader specializing in water-based and solvent-based coating and saturation services for all types of materials. We have a great deal of experience helping our clients improve their products and processes, in industries ranging from automotive and aerospace to bio-medical and consumer products. We are ready to help you with your unique needs as well. To learn more, visit our Capabilities page.